Stack Exchange releases "data dumps" of all its publicly available content roughly every three months via archive.org, and also makes that information queryable over the Internet at the Stack Exchange Data Explorer (SEDE). Over time, as new features and other bits of data are introduced to Stack Exchange sites, the "anatomy" of the data dump is likely to change. What is the current structure of the public data dump? You find in Posts all non-deleted posts. PostsWithDeleted includes deleted posts while sharing the same columns with Posts but with only a few fields populated which are marked with a 1 below. Despite the name, this table in fact contains close-related flags and votes. 19 = Question Protected - question was protected by a moderator. 20 = Question Unprotected - question was unprotected by a moderator. 27 = Post unmigrated/hidden moderator migration? Comment: This field will contain the comment made by the user who edited a post. CompletedByReviewTaskId id associated to the ReviewTaskResult that stores the outcome of a completed review. If both approval and rejection date are null then this edit is still in review (and its corresponding entry in ReviewTasks will have an active state as well). ApprovalDate - NULL if not approved (yet). RejectionDate - NULL if not rejected (yet). - xxxTypes tables which list (Id, Name) pairs for Posts.PostTypeId, Votes.VoteTypeId, etc. See Show all types for an up-to-date list of all types. All timestamps are UTC, default format: yyyy-MM-dd hh:mm:ss (stored with milliseconds). 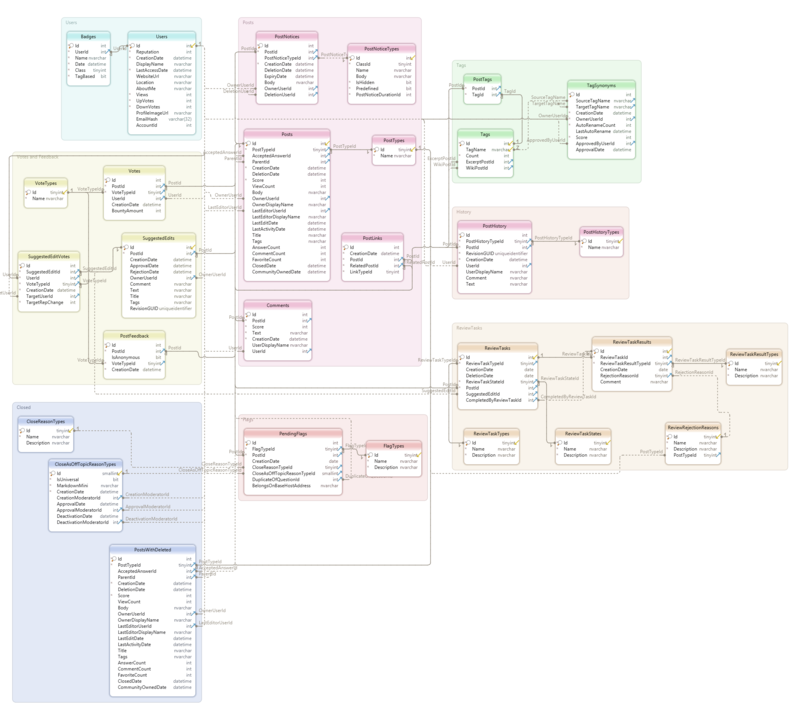 The Schema Visualized The Entity Relationship Diagram (ERD) above was constructed using the data found in the information_schema.columns table. (Thank you to ashleedawg for paring the table down to its bare essentials). Python 3 was used to convert all the table, column and key information into a SQL script. (All tables, columns, and foreign key constraints as specified in the accepted answer were included.) The ERD was reverse engineered using dbschema. Please find the script and other related files in my GitHub repository. Not the answer you're looking for? Browse other questions tagged support faq data-explorer data-dump . Documentation for Stack Exchange Data Explorer Schema? What is LastAccessDate in the Database schema? What is the meaning of posts.communityowned date? Stack Exchange SQL dumps don't contain answers? What are all the IDs on the /reputation page, and what do they mean? What is the AcceptedAnswerId field in Stack Overflow data MSR 2015? How do I link the Stack Exchange data together? Why is the data-dump generation not (more or less) fully automated? Is database schema documentation available from the Stack Exchange Data Explorer? Shouldn't it be in the FAQ? Can the Stack Exchange data dump be provided as a public data set on Amazon Web Services (AWS)? Is the dump of the database behind stack exchange data explorer available?